In the Part 1 of this four-part series we looked at the common terms you must know, TARE, ATM, GVM and GCM along with Kerb weight which is the vehicle weight assuming a 75kg driver and a full tank of fuel (this can vary depending on the manufacturer). We had a look at the most common 4WD dual cab utes that are used as tow vehicles in Australia, their maximum payload and the actual towing capacity once the vehicle is fully loaded. One of the big misunderstandings is that if a vehicle is rated to tow 3.5 tonne then you are OK to hook up your fully loaded caravan and hit the road. While this is true for some vehicles it is not the case for all vehicles. The problem is payload, what you put into your tow vehicle, because this extra weight can REDUCE your legal towing capacity. A good example is the Ford Ranger. When unloaded the Ranger will tow 3.5 tonne no problems but once you load the vehicle up with a full legal payload of 950kg you can only tow 2.8 tonne. With all these figures below we are assuming you will have the vehicle fully loaded because in our experience, no one does a trip around Australia with an empty vehicle. Because if you exceed your legal load rating your risk of having an accident increases. Overloaded brakes, overloaded suspension and chassis along with an increased chance of caravan sway that can result in rollover (we will be looking at the causes and control measures for caravan sway in Part 4). If you are overloaded and have an accident your $180,000+ rig will have NO INSURANCE!! So lets have a look at some more tow vehicles and their rated verses actual towing capacity. Please remember that the figures below may vary slightly depending on year and model, also any optional extras fitted to the vehicle will change these numbers. As you can see the 200 Series and 70 Series can both take a full payload and still tow their rated 3.5 tonne load. The Pajero can also tow it’s maximum 3 tonne when full loaded, however both the Jeep Grand Cherokee and the Toyota Prado MUST have their tow load reduced when carrying a full payload in the vehicle. It very important that you know exactly what your tow vehicle can legally tow when fully loaded before you commit to buying that big new caravan. As I said in the first blog the Federal laws relating to GVM and GCM upgrades are in the process of changing and the net result of this will be that soon, GCM ( Gross Combination Mass) upgrades will no longer be allowed. You will still be able to get a GVM upgrade but this won’t help you if you want to tow a caravan that exceeds your allowable tow weight. Example of the effects of a GVM and GCM upgrade on a Toyota 200 Series. Actual tow load@ full payload 3,500kg + 1,220kg payload or 4,000kg + 720kg payload. Actual tow load@ full payload 3,000kg + 1,220kg payload or 3,500kg + 720kg payload. As you can see, what you can tow will change depending on how much weight you have in the tow vehicle. The other option is to buy a bigger tow vehicle if you want to tow a BIG caravan + a full payload of gear. There are a number of American big truck options on the market that can handle the bigger loads. 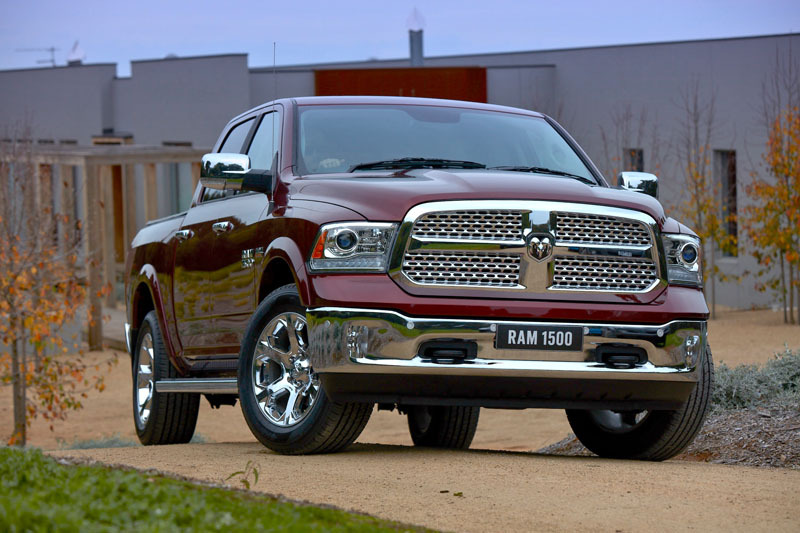 One example is the new Dodge Ram 1500 Laramie Dual Cab 4x4 ute with a 1.7m tray and 3.92 ratio axle. If this all sounds too hard you are not alone. Many people in the caravan industry struggle to understand, or don’t want to understand how the rules are applied, but the basics are fairly simple. Hopefully this information helps you make an informed decision before you commit your hard earned money on a new rig. Please remember the numbers supplied are only a guide as there are many individual variables that need to be considered. Things like maximum front and rear axle loading, upgraded braking system and tow hitch canter lever distance from axle all need to be factored in so seek advice from a professional company before you make your final purchase. In Part 3 of this series we will be looking at your vehicle GVM, Kerb Weight and what makes up a typical payload. You might be surprised at what you do and don’t need fitted to your vehicle and how easy it is to ditch the stuff you don’t need, take the stuff that you want and still stay under the legal load limit. In part 3 of this series we take a look at tow vehicle payloads and how they affect you're legal tow limits.